Kettering Town have the opportunity to take over at the top of the Evo-Stik League South Premier Division Central tonight (Tuesday). The Poppies moved to within striking distance of Stourbridge after their 1-0 victory over Royston Town was coupled by a surprise 2-1 defeat at Hitchin Town. Marcus Law’s team now sit just a point behind the Glassboys and will go clear if they can beat Coalville Town in their third home game in a row at Latimer Park this evening. 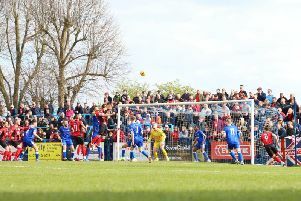 The Poppies needed a late Aaron O’Connor goal to earn a 2-2 draw at play-off chasing Coalville in the reverse fixture 10 days ago. Law is expecting another tough examination tonight but he knows a win would give his team an extra edge with the top two on a collision course in the West Midlands on Saturday. “It would be nice (to go top) but we know there will be lots of ups and downs,” Law said. “It felt like April at the weekend because you heard people talking about what Stourbridge were doing and I am sure it was the same for them. “That’s happening because it has turned into a bit of a two-horse race and everyone is waiting for someone else to slip. “We are concentrating on ourselves. We have an opportunity again but it will be tough. “Coalville will come and go toe-to-toe with us. They will have a go and put us under pressure . The Poppies will definitely be without Rhys Hoenes who serves a one-match suspension but Adam Cunnington looks set to return after a back injury. And Law will also be checking up on the fitness of defenders Declan Towers and Dion Kelly-Evans after both had to be withdrawn during Saturday’s success. “Declan has a knee problem and was feeling it slightly before the game and then the challenge he made knocked it back a little bit so we will keep a check on that,” the Poppies boss added. “Dion’s issue may be the strains of so many games on tough pitches and he was feeling his hamstring and quad a little bit.